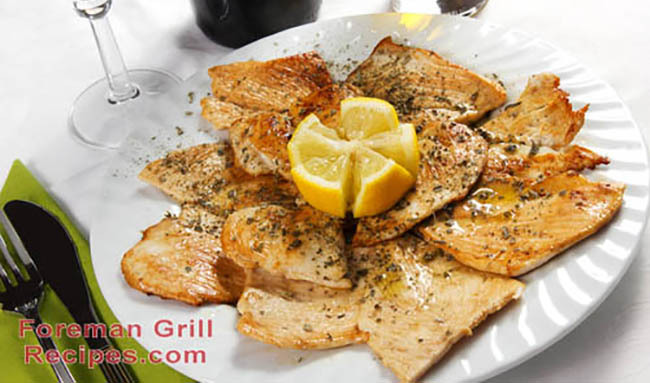 Lemon Herb Grilled Boneless Skinless Breast is a delightful dish that need not be limited to the ingredients listed. The thyme, basil, parsley and oregano will give this dish the classic herb combination that is so popular and delicious. Feel free to try different herbs from your garden or to your own liking. Hard to go wrong with this dish! Layout chicken breast on a flat covered surface and pound with a meat mallet to 1/2″ – 3/4″ thickness. Place in plastic ziploc back with all other ingredients for 1/2 hour or longer if desired. Preheat your Foreman grill for 5 minutes. Grill chicken until juices run clear or internal temp of 165 degrees, approximately 3-5 minutes. Remove from grill and let sit for 5 minutes. Serve with fresh grilled vegetables.